To request additional information or to sign up for any of these services, please contact member services at (740) 450-1375. A weekly report distributed by email, fax, or U.S. mail consisting of drilling permits issued by the Ohio Department of Natural Resources, Division of Oil and Gas Resources Management. This report is available via fax or mail to members for an annual cost of $110.00. A weekly report distributed by email, fax, or U.S. mail consisting of plugged/abandoned well permits issued by the Ohio Department of Natural Resources, Division of Oil and Gas Resources Management. This report is available via fax or mail to members for an annual cost of $100.00. A monthly report distributed by U.S. mail consisting of completion records, and permits (plugged/abandoned and drilled) for the month. Included with the report is a summary detailing new locations, types of completions and production totals for the current and previous month, along with the previous year's totals. This report is available to members for an annual cost of $100.00 per year. A monthly magazine distributed by U.S. mail designed for oil and gas producers and operators, along with the related service companies. A complimentary Annual Subscription is included with Membership. 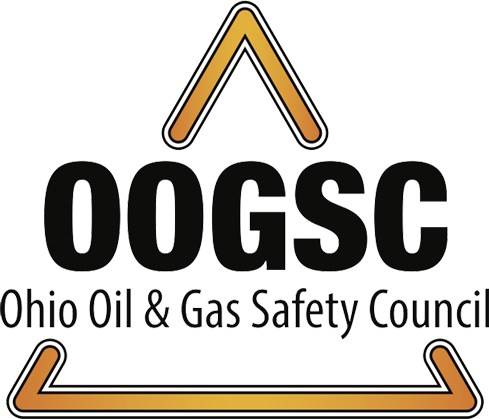 The Ohio Oil & Gas Safety Council (OOGSC) is a not for profit organization organized in 2013 by the Ohio Oil & Gas Association (OOGA) in collaboration with the Ohio Oil & Gas Energy Education Program (OOGEEP) and the Ohio Bureau of Workers Compensation (BWC) Division of Safety & Hygiene (DSH). The cost is $50.00 for members and $150.00 for non-members. Please contact OOGA at 614-824-3901 to arrange for purchase. Dozens of training courses are available through BWC’s Division of Hygiene and Safety. These course are offered through the training center at the Ohio Center for Occupational Safety and Health (OCOSH) located in Pickerington. Courses are also offered at branch sites located in Toledo, Cincinnati, Canton, Cambridge, Portsmouth, Youngstown and Cleveland. Employers may enroll any number of employees at no additional cost. To enroll or learn more about the courses available, visit the BWC Learning Center. Since 1927, BWC has provided a forum for Ohio businesses to increase their knowledge and discover products and services that can keep their workers safe and healthy. This year, the 2014 Ohio Safety Congress & Expo (OSC14) March 25-27, 2014 will continue that tradition by helping you foster a culture of safe and healthy behaviors both on and off the job. Provide cost-effective, multidisciplinary training and professional development. Well at home. Safe at work. For information regarding Ohio workers’ compensation that is specific to the oil and gas industry, please visit the BWC Info for Oil & Gas Industry Employers web page. As a member of the Ohio Oil and Gas Association, both you and your employees may enroll in any of the benefit plan options listed below. For a price quote or additional information, contact OOGA at 614-824-3901 or OOGA’s Agent, James F. Harmon, by any of the following methods below. Healthcare cost continue to rise each year as such, OOGA offers a group program designed to meet the needs of the association. As OOGA's authorized Broker and longtime member, we are able to provide you with the best health plan for all size companies, including companies of one employee. This Companion Life provides a plan that is unique for associations. This plan has no waiting periods and is designed as a group vision plan. Coverage will begin on the first of the month after your date of renewal and benefits include annual eye exams, lenses and glasses. You also have the choice of individual, individual + spouse, One parent family or two parent family coverage. This Companion Life provides a plan that is unique for associations. This plan has no waiting periods and is designed as a group dental plan. Coverage will begin on the first of the month after your date of renewal and benefits include preventative, basic and major. You also have the choice of individual, individual + spouse, One parent family or two parent family coverage. These plans are individually designed and as a member of the OOGA you will receive an additional premium discount. Some of these plans may be tax deductible to your company. This Colonial Life Plan provides supplemental income to you in addition to other coverage for accidents, anywhere-at home or at work. You also have the choice of individual, individual + spouse, One parent family or two parent family coverage. This plan is provided at the group rates, so you can get the purchasing power OOGA provides. This plan from AUL OneAmerica can be a supplement to your existing life insurance at affordable rates. These plans are available for you the member and even your dependents. You can select from different plans starting at $25,000 up to $250,000. It provides up to $100,000 of Guaranteed Issue Life Insurance for the member. Also, there are 3 packages of coverage for spouse and dependent life insurance ranging from $5,000 to $20,000. This plan from BOST Advantage Card provides 24/7 access to a doctor with a click or phone call. With Teledoc, you can talk to a doctor by phone or online video consult to get a diagnosis, treatment options and prescription if necessary. Save time and money by avoiding crowded waiting rooms in doctor’s office, urgent care clinic, or ER. Just use your phone, computer, smartphone or tablet to get a quick diagnosis by a U.S. licensed physician. There are 3 plans available that include additional discount programs for lab testing, pharmacy, hearing aids, counseling services, Pet Assure, Wellness, financial helpline, health advocate, medical health Advisor, Nurse line, Legal Care Direct and ID Sanctuary to meet your individual needs. If you pay into the Ohio Bureau of Workers’ Compensation (BWC) for workers’ compensation premiums, we have savings programs and cost containment strategies for you that are already a part of your member benefits with the Ohio Oil and Gas Association (OOGA). For more information on all of the alternative rating / premium discount programs, click here. CompManagement offers a free, no-obligation evaluation to assist with your annual due diligence to compare discount opportunities and fees. This is an opportunity to compare TPA services and receive valuable account information including rating options, premium estimate and claims history. CompManagement’s experts will offer suggestions for participation in programs that can be stacked together to maximize your savings. If your current third party administrator is not providing your organization with these alternative options, or elevating your service experience, consider enlisting the services of CompManagement, Ohio's leading workers' compensation administrator and take advantage of this tremendous member benefit offered by OOGA. CompManagement’s Safety Academy courses provide you with compliance programs to meet OSHA’s core regulatory standards, while also equipping you with industry-specific and safety-oriented tools to reduce occupational incidents and eliminate physical hazards. All courses are webinar based and will be available and updated throughout the year. The Ohio Bureau of Workers' Compensation (BWC) requires all Group Rating and Group Retrospective Rating employers that have incurred a workers' compensation claim in the past two years attend 2 hours of safety related training. If you have received a letter from either OOGA or CompManagement stating that your company had a claim, you will find various classes available on this page to satisfy the training requirement. In order to comply with this requirement, it is necessary that a record be kept of this training. When you have completed the training you will need to report this to CompManagment. Please use the Safety Training Reporting form in order to have your safety training recorded and reported appropriately to BWC. You may also need to fax required documentation to CompManagement at (866) 567-9380.